This would have been extremely troublesome to say the least had Clinton won and Trump refused to acknowledge it. What would he have done or said to his hair-on-fire angry supporters? All his comments and tweets during the campaign and the nine months since he took office—far too many to list—give many people anxiety as he navigates towards a military confrontation with North Korea, Iran or both. From his bizarre narcissism to his lies about virtually everything to his need to fight people who are revered by most Americans, Trump’s fitness for office has been rightly questioned. “The President has not yet been able to demonstrate the stability nor some of the competence that he needs to demonstrate in order to be successful,” said outgoing Senator Bob Corker (R-Tenn.) in the first of several salvos lobbed Trump’s way. I am by no means a mental health professional but it is clear Trump’s penchant for projection; i.e. blaming people for doing the things he does, should raise a red flag. A good example would be his constant criticism of President Obama for playing golf when he, in fact, plays almost every weekend. 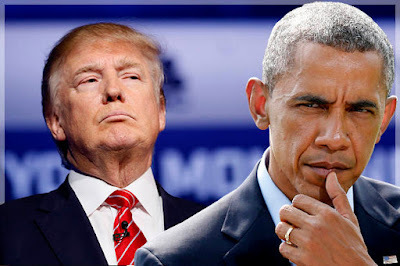 His obsession with all things Obama is simply startling as is his need to re-litigate the 2016 election and rub Clinton’s face in the dirt. Trump’s fights with Gold Star families would otherwise be political suicide, but with the Republican Party still terrified of him and his supporters, they run for the hills when asked to comment on his stunning behavior. I am certainly not alone who believe that Trump’s words and actions are downright scary. In a recent poll, one in three believe Trump’s mental health is poor. In addition, a new book has recently been published titled “The Dangerous Case of Donald Trump: 27 Psychiatrists and Mental Health Experts Assess a President.” While the authors cannot provide a diagnosis without an examination of the President, they write we should all be concerned about Donald Trump’s mental health. 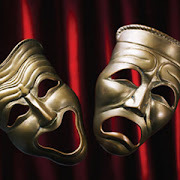 Pathological narcissists feel entitled to whatever they want and have “empathy-impairment.” (That certainly came into play during the needless, recent skirmish with a Gold Star widow,) They often are emotionally volatile and employ “gaslighting” to create their desired reality. My own belief is that this characterization seems applicable when, for example, Trump was not joking when he mused that then FBI Director James Comey was getting more attention than him. 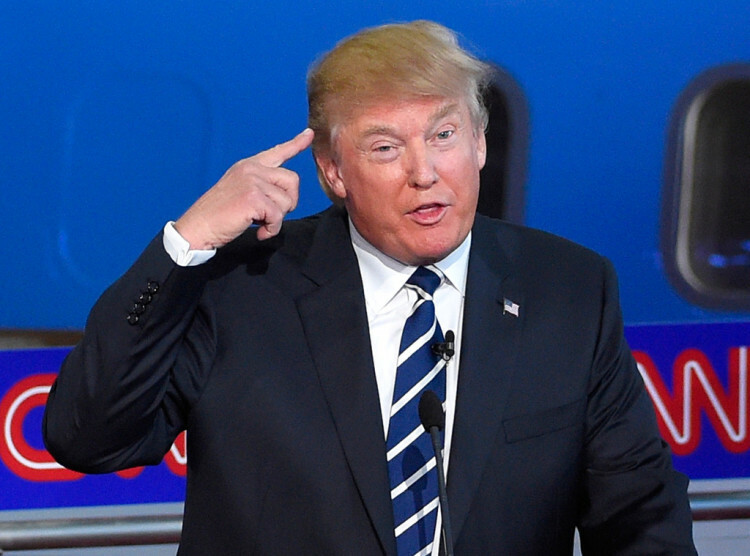 So what if the President has some form of mental illness? If backed against a wall, what would Trump do? Does anybody actually believe he would sit quietly if there was a 25th Amendment action taken against him or in the event of impeachment proceedings? His threatened refusal to accept the election results had he lost provides a clue. We’re a long way from that happening if it ever does, but frankly I’m scared. Recall how he famously asked why do we have nuclear weapons if we can't use them? He has access to the nuclear codes, whereby a strike cannot be vetoed or overruled by any party. Congress knows that. Will they be willing to take the chance even if the evidence against him on obstruction of justice charges is compelling or even proven collusion with the Russian government to alter the election? I’m afraid not. Trump’s dubious mental health provides him with the necessary insurance. Wouldn’t you like to escape for a couple of hours from the current tumult in the world and head back to the 1950’s when polio shots were mandatory, kissing with tongue seemed like hitting a triple, and air raid drills were routine? If so, then head to the Slayton House Theater in Columbia to see “Cry-Baby the Musical” presented by Silhouette Stages. Director and Choreographer Tommy Malek and Assistant Director Matt Wetzel guide a terrific group of performers under the musical direction of Nathan C. Scavilla and John Keister in what is an extraordinarily executed, gorgeously costumed production. With a book by Mark O’Donnell and Thomas Meehan and songs by David Javerbaum and Adam Schlesinger, the musical version of John Waters’ 1990 film of the same name doesn’t contain the vulgarity normally associated with Waters’ past films. And this particular work, though it received four Tony Award nominations in 2008, didn’t endure on Broadway past the 68th performance. 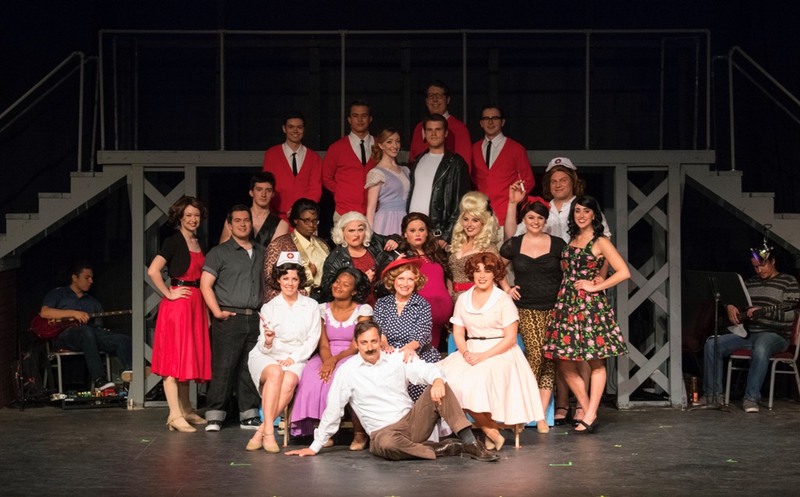 The hope was that the show could match the theatrical success of “Hairspray” that had been adapted by Mr. Meehan from another famous Waters film. While “Cry-Baby and “Hairspray” deal with class warfare in Baltimore, “Cry-Baby” does not contain the provocative social messaging within the storyline of “Hairspray” (racial segregation) or match its potent score. Nonetheless, Silhouette Stage’s production of “Cry-Baby the Musical” knocks it out of the park. The prevailing campiness and the quirkiness of the characters that are a hallmark of Waters’ portfolio are evident throughout, and a youthful enthusiastic cast seems to have a great time performing. Rachel Sandler and her four-piece orchestra situated at the back of the stage do an excellent job of supporting the vocals without overwhelming them. And you can credit Alex Porter for superb sound design allowing every note, every lyric and every spoken word to be heard with great clarity. 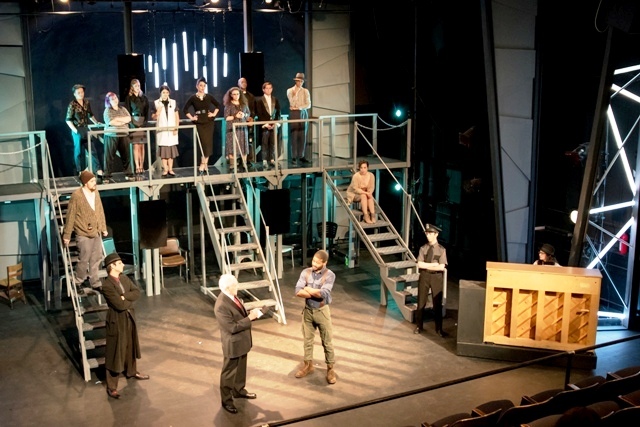 He and Mr. Malek designed the set, which consists largely of scaffolding and stairs with an assortment of set pieces to denote scene changes. Costume Manger Clare Kneebone assured that the cast is fitted in spot on period garb including colorful dresses and sweaters for the richer kids as well as leather jackets, tee shirts and jeans for the others. Specialty costumes for the eccentric characters add to the laughs. 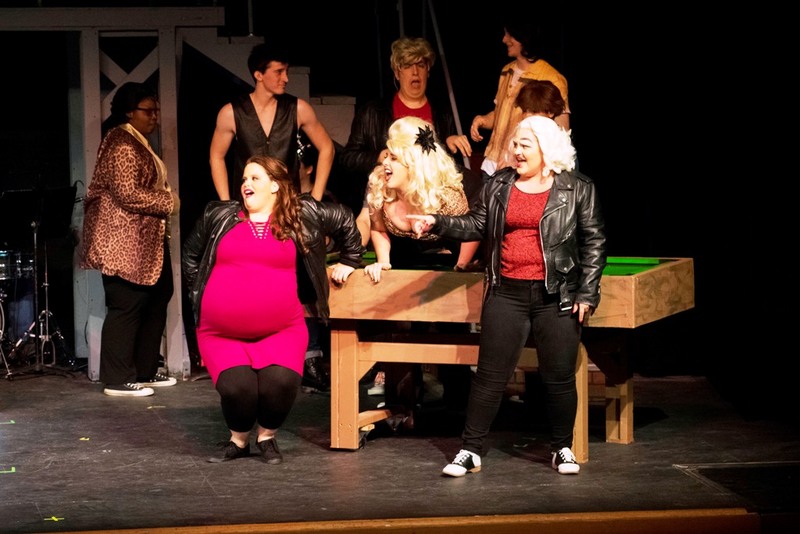 Set in Baltimore in 1958, “Cry-Baby the Musical” pokes fun at the early James Dean and Elvis movies and the rockabilly music that surrounds the plot. The story centers on Allison Vernon-Williams (played charmingly by lovely Lindsey Litka), a never-been-kissed, upscale society girl who would like to cross those proverbial tracks to become a “drape” (delinquent). She does so when she connects with a drape Wade “Cry-Baby” Walker (Michael Nugent), a cool, good-looking, aspiring rock ‘n roller who is not anywhere as bad as his reputation. He is orphaned as his parents were wrongfully convicted of a crime and executed. Be patient; there are loads of laughs to be had. Allison has to overcome two obstacles: her pious, wealthy protective grandmother, Mrs. Cordelia Vernon-Williams (played superbly by Conni Ross), and her corny, squeaky-clean, square boyfriend, Baldwin Blandish (played sprightly by Matt Sorak). Allison wants to leave the bland Blandish behind and find a new adventure with Cry Baby. It’s not that simple though. Michael Nugent as the title character puts on a tour-de-force performance. Commanding the stage, handsome Mr. Nugent rocks a pair of tight jeans, leather jacket and a tee-shirt like it’s nobody’s business. His acting is strong without going over the top, and he delivers the comedic lines with skill and good timing. Mr. Nugent is blessed with a solid singing voice and performs extremely well in a duet with Ms. Litka in the clever “I’m Infected” and as a solo in “Do That Again”—one of the few conventional song titles. In another duet with Ms. Litka, “Girl, Can I Kiss You…?” he tries to introduce French kissing to the innocent girl and the number is totally hilarious with John Waters’ affinity for the outrageous all through it. There are the eccentric drapes that form Cry Baby’s posse and who encourage Allison to transform her upscale persona to theirs. 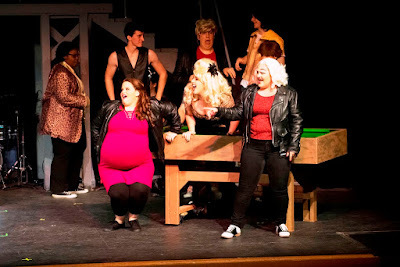 Pepper Walker, Cry Baby’s switchblade-toting pregnant 16 year-old sister is played hilariously by Amy E. Haynes. So pregnant is she, I thought she was about to give birth to a DeSoto. My favorite character—the one I relate to the most—is Mona “Hatchet-Face” Malnorowski, a disfigured soul who was told when she was younger that she could rob a bank just by using her face! She proudly brags that she is equally ugly on the inside. Hatchet-Face is played exceptionally by Parker Bailey Steven. Then there is Lenora Frigid, an odd girl whose engine apparently does not contain all of its spark plugs. Played superbly by Bailey Wolf, she wants to be a drape and is smitten with Cry Baby. Her rendition of the hilarious “Screw Loose” is one of the show’s comedic highlights. Back across the tracks, Conni Ross deliciously plays the role as Allsion’s wealthy, protective, moralistic grandmother, Mrs. Cordelia Vernon-Williams (Allison’s parents, too, are dead), who desperately tries to keep her young granddaughter away from that bad-boy Cry Baby. She excels in the solo “I Did Something Wrong Once” and what she was referring to was a biggie. Matt Sorak as Baldwin Blandish, the conservative square who plays a key role in a plot twist that will not be revealed. He is completely campy and fun. Baldwin is a part of a doo-wop group called The Whiffles, always dressed alike, who hopes to make a record. The members played by Johnny Dunkerly, Jacob Hale and Jeff Miller do a fine job with their vocals and dancing. Their numbers “Squeaky Clean” and “This Amazing Offer” hit the mark. Rounding out the talented cast are Richard Greenslit as Judge Stone and Officer O’Brien, Christopher Kabara as the Bailiff, Mr. Woodward and DJ, the male ensemble Bradley Allen, Derek Anderson, , and the female ensemble Maddie Bohrer, Libby Burgess, Ty’Aira Johnson, Lauren Romano and Jamie Williams. 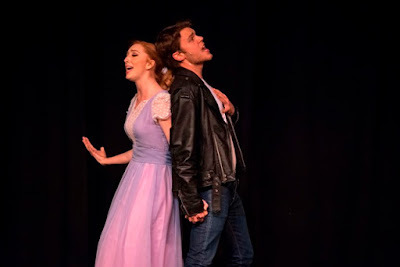 Silhouette Stages’ presentation of “Cry-Baby the Musical” is a lively, well-staged production with a splendid cast and is community theatre at its best. The show is not here long so hurry up and catch it. The only tears you will have will be from laughing. Advisory: “Cry-Baby the Musical” contains adult language and situations and is not recommended for children under 12. 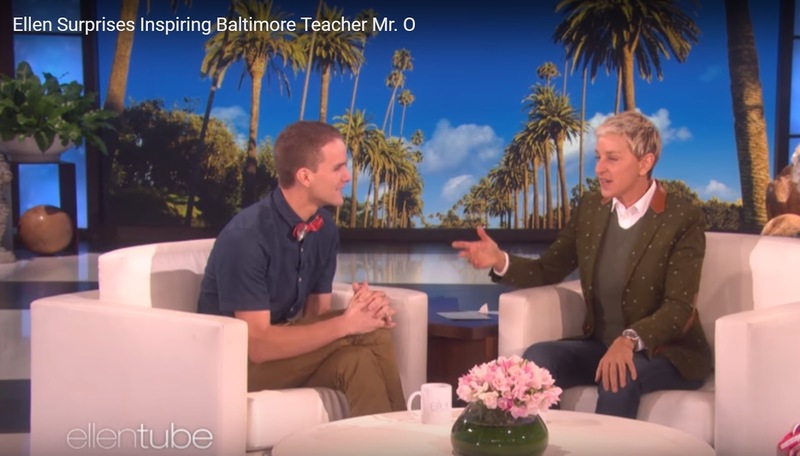 Wyatt Oroke, a Baltimore teacher for five years, appeared on the Ellen DeGeneres Show this past week to receive a series of surprises. 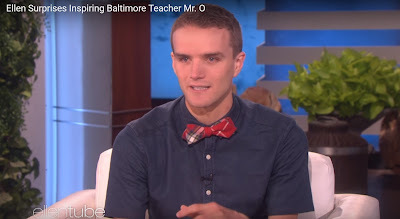 Oroke, who had been invited to the studio, was led to believe he was being recognized for his work in the East Baltimore City Springs Elementary Middle School with a pre-recorded clip praising his work with his students, who call him “Mr. O”. Suddenly, he was told he was going to sit in that famous chair on the set to talk live with Ellen herself. Clearly emotional and taken aback by the unexpected appearance in front of the lights, cameras and live audience, Oroke participated in a brief interview with Ellen. 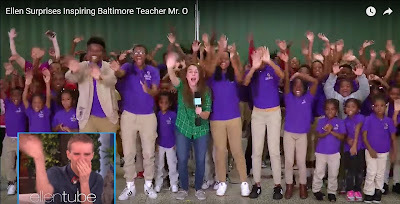 Then he was stunned and became teary-eyed when a significant number of students appeared live by remote from Baltimore to offer praise of the young Humanities teacher, how he has inspired them, and how, in one student’s case, he provides the needed support since she lacks a support system at home. If that wasn’t enough, a check for $25,000 from Shutterfly was presented to the school, again shocking Oroke. Oroke points out that the East Baltimore school is “under resourced and underserved for centuries based on political decisions that were made, segregate housing, or redlining for neighborhoods. 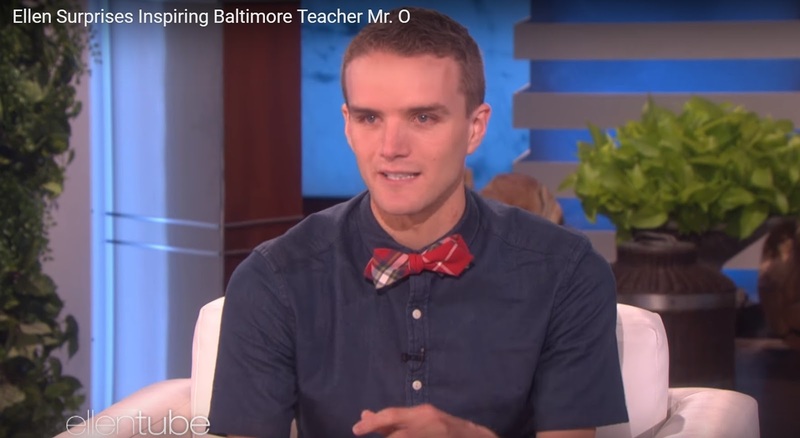 ” This resulted in the fact his “students come from the highest poverty rates of any school in Baltimore City.” Moreover, Oroke notes there have been homeless students every year, one lost to gun violence, some have given birth to children. 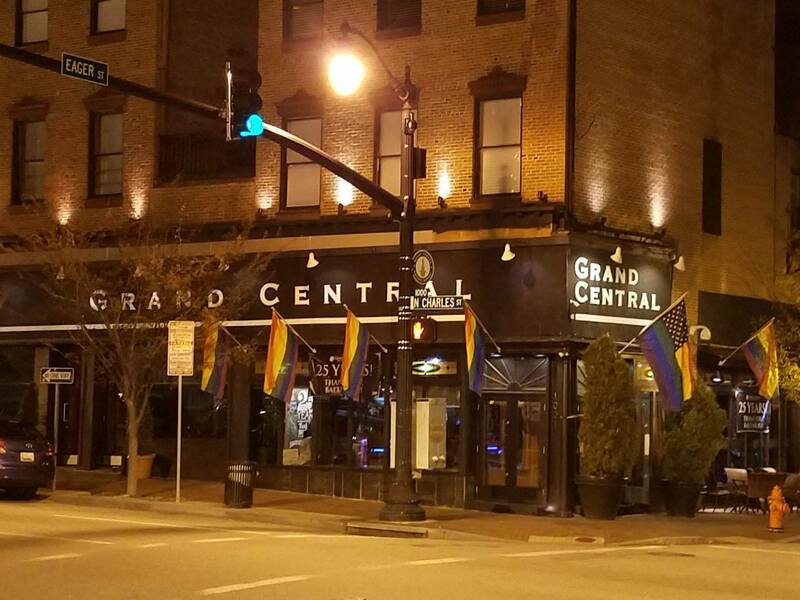 Oroke is an ally of the LGBT community and a member of the Board of Directors for GLSEN Maryland. 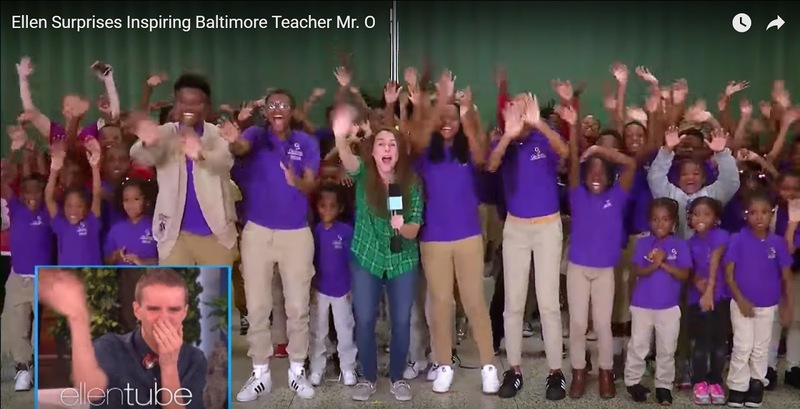 Lyles states that Oroke’s students raised thousands of dollars for the recovery effort in Puerto Rico despite being from some of the poorest neighborhoods of Baltimore. 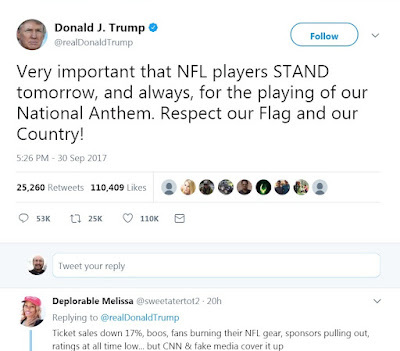 Instead of responding with leadership to assure U.S. citizens there are at the very least receiving basic essentials, the President decided to go to his refuge—Twitter—and deflect again from a string of losses to create an issue of NFL players kneeling during the National Anthem at the games played last weekend. Instead of calling the Mayor of San Juan Carmen Yulín Cruz four times during the week to determine the immediate needs of those victimized citizens, he called Dallas Cowboys owner and his friend Jerry Jones four times to insist that his players stand for the National Anthem. When he eventually tweeted about Puerto Rico, he did so with the pettiness, narcissism and immaturity that have characterized his presidency so far: blaming others for missteps, taking credit for things he did not accomplish, exaggerating his abilities, and disclosing that Puerto Rico is an island in a very big ocean. This pathetic, callous and rather un-American response is appearing as his own Katrina albatross and would add to another hard-to-swallow loss. However, if he was ever looking for a win to stem this descent, the football angle appears to be what his doctor ordered. Last year, San Francisco 49ers quarterback Colin Kaepernick took it upon himself to protest the all-too-frequent occurrence of police officers gunning down unarmed African-American men and wind up getting away with it. These incidents have unquestionably been a stain on our society and Kaepernick, a black man, felt compelled to “take a knee” during the national Anthem prior to games last year. He was booed mercilessly by fans and excoriated on social media with few of his peers demonstrating support. Kaepernick was eventually let go by the 49ers and has yet to find a new team despite the fact he is better at this position than some of the current starting QBs and clearly better than many of the backups. He is still awaiting that call. 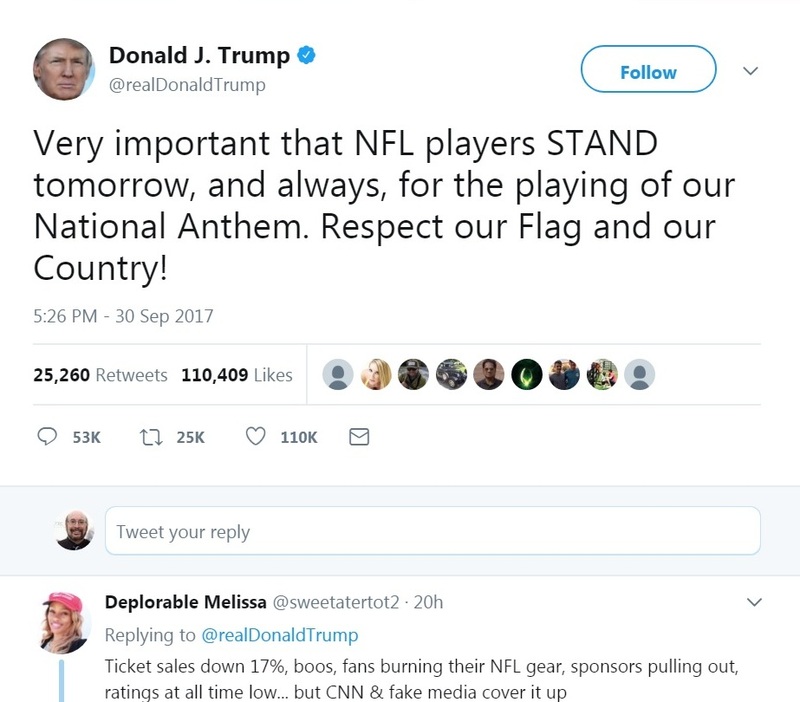 So Trump lambasted players for not standing during the Anthem and told owners to fire those protesting players because they are disrespectful to the flag. In a rebuke to Trump last weekend, teams around the NFL joined in the protests, and it took different forms—kneeling, joining locked arms, remaining in the locker room while the Anthems were played. Seizing the opportunity to demagogue and to deflect from his troubles, Trump took to Twitter and blasted the protesters. He cast the kneelings as a disgrace and an affront to the flag, the Anthem, the military and our country. He and his supporters maintained that our servicemen and women fought and died in combat to defend our flag and Anthem. To be clear, we have never gone to war, never shot a bullet, or never bombed a target to protect our flag or the National Anthem. Nobody died in defense of these symbols. In fact, our troops have always defended our Constitution, which includes Freedom of Speech and the right to protest peacefully. This is hyperbole at its worse, using the casualties of our military conflicts as props in a cynical political effort to feed red meat to the frothing-at-the-mouth base. As an aside, Trump has no standing as far as military appropriateness is concerned regardless of his title as Commander-in-Chief. He dodged the draft on five occasions, took on a Gold Star family for political gain, and is clueless as to the meaning of the Purple Heart. Nonetheless, Trump turned this legitimate protest into a question of patriotism and what he did what he does best, divide the country on race. He riled up his mostly white base so that they have adopted his logic and has couched these protests as nothing short of treason. To a large extent, it has worked. Fans burned various teams' jerseys, caps and what-not. 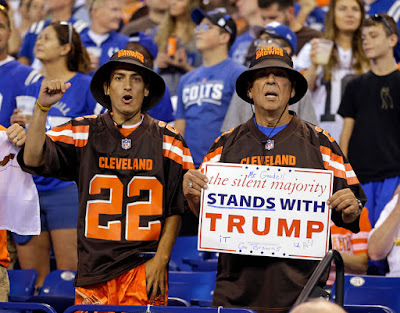 They threatened to cancel season ticket subscriptions. (Note that most if not all of those anti-protesters don't stand for the National Anthem in their living rooms regardless of the sport, but who cares about hypocrisy?) The anti-protesters grabbed the momentum and seem to be winning the argument. Accordingly, NFL games this week saw less players taking a knee during the Anthem than last week. When players knelt to pray for kindness and equality in our country prior to the National Anthem, fans at Baltimore’s M&T Bank Stadium booed vociferously even though the public address announcer explained what they were doing. Then the players rose when the Anthem began. So uptight about the week-long debate was Ravens’ management and sensitive about being labeled anti-military, they included every military trapping they could muster before the game including a flyover by military aircraft. I was surprised not to see members of the 101st Airborne Division parachuting to mid-field for the coin toss. But others disagree and see the protests as disrespecting our national symbols and country. Trump pounced on this controversy to once again stoke divisions while the people of Puerto Rico stand in lengthy lines in oppressive heat for food, water, fuel and access to cash. We see where the President’s priorities lie. UPDATE: The clock ran out and apparently Trump won this game. Here is an explanation in Politico. Sometimes history has a way of repeating itself. Imagine a musical from 80 years ago having relevancy in the present. That is the focus of Iron Crow Theatre’s presentation of The Cradle Will Rock kicking off their 2017-2018 season themed “Season of Identity” at the Baltimore Theatre Project. Ably directed by Tony Award-nominated Sean Elias, Iron Crow’s Artistic Director, and assisted by Robert Corona, this tight, well-paced production moves Iron Crow another step forward in exploring issues of identity, class and power and the inevitable conflicts they produce. 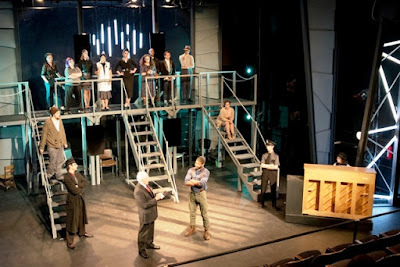 A sizable, spirited ensemble and an imaginative and functional set designed by Chris Miller are effective under Mr. Elias’ guiding hand in bridging the issues confronting the nation decades ago with the current state of affairs. 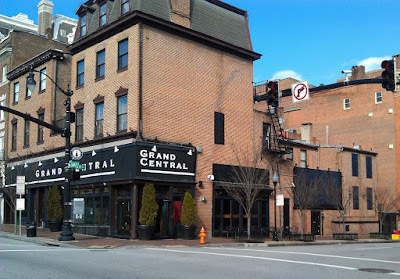 The Cradle Will Rock perhaps will be remembered mostly as the first show ever to be shut down by the federal government. In 1937, the federal agency Works Progress Administration (WPA) oversaw the Federal Theatre production, which had been in rehearsal for weeks. The WPA hurriedly canceled the production at the Maxine Elliott Theatre under the guise of budget cuts and sent armed guards to keep any costumes or sets from being removed from the theater. Many believed that the musical had been censored because the pro-union plot was “too radical.” Moreover, Actors’ Equity barred cast members from performing the show onstage. Undaunted, Mr. Blitzstein, Producer John Houseman, and Director Orson Welles found the Venice Theatre and a battered upright piano. They along with the cast and hundreds of onlookers marched 21 blocks uptown to the theater garnering a bonanza in publicity. As Mr. Blitzstein launched into the introduction, Olive Stanton, who played the character Moll, stood up in her seat and sang the opening number from the audience. The rest of the cast followed suit. 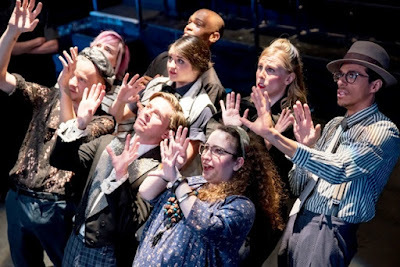 While it is doubtful the federal government would try to stop Iron Crow from presenting this musical, Mr. Elias strives to connect this piece with the corruption and bullying tactics of our president and his administration and the income inequality that exists in our society. "The Cradle Will Rock is a direct response to and protest against the current administration, the evils of unregulated capitalism and the dangers of an imperial presidency,” says Mr. Elias in a statement. Indeed, there are similarities, and the use of ephemeral projected images of President Trump, Department of Education Secretary Betsy DeVos and others on four small screens at the rear of the stage visually fosters that connection. The ten-scene, single act musical is narrated both musically and verbally (announcing scenes) by the sole musician, pianist Mandee Ferrier Roberts, who expertly performs virtually throughout the show. The piano, which includes a repository for props next to it, is moved about the stage for the various scenes and the back of it is used at times as a bar or a judge’s desk in the courtroom. The Cradle Will Rock is set in the fictional town Steeltown, USA during 1937 while the Depression was still in high gear. The story centers on Larry Foreman (played powerfully by Terrance Fleming whose rendition of the title song is superb) and his attempts against the odds to unionize Steeltown’s workers. He must contend with the town bully, greedy, authoritative, anti-union Mr. Mister (not to be confused with the 80’s pop rock band of “Broken Wings” fame) who controls institutions including the factory, the newspaper, the clergy, the arts, the university, even a physician. His role is portrayed smoothly by theatre veteran Greg Grenier, though I would like to see him, as the antagonist in the story, come off a little meaner. Most of the characters in this ensemble production are either victims of Mr. Mister, such as Harry Druggist (played emotively by Jonathan Jacobs) who have sold out to Mr. Mister one way or the other, or members of the Mister family including Mrs. Mister (I love that name) played by Allison Bradbury and their son Junior Mister (effectively played by Mark Quackenbush). He’s an incompetent Eric Trump-like figure who, as a result of the reluctant compliance of the newspaper’s editor to Mr. Mister’s demand, is deposed to Honolulu as a correspondent. Matt Winer passionately and energetically plays Stevie, the son of Harry Druggist, who gets killed in a car bombing intended to murder Gus Polock, the newly elected member of the union (Mark Quackenbush) and his wife, Sadie (Monica Albizo who also plays the role of Sister Mister). Ian Andrews as Virgil, a clumsy-ish policeman, is comical with his Keystone Kops movements. Felicia Akunwafor as Ella Hammer, the sister of a killed steelworker, performs the show-stopper number “Joe Worker.” In this emotional song she futilely pleads with Dr. Specialist (Roxanne Daneman) not to state that her brother was drunk causing his accident as pushed by Mr. Mister but in fact he was murdered. Rounding out the cast are Barbara Madison Hauck as President Prexy, Chelsea Paradiso as Professor Mamie, and Meghan Taylor as Professor Trixie. Chris Miller’s set has been touted as Iron Crow's largest ever. It has an industrial feel to it given the locale is Steeltown. It includes a scaffold with three sets of stairs leading from the stage and sets of industrial looking lights on the sides and rear. As mentioned earlier, four small projection screens are mounted on the back, and a few chairs are also in the rear where performers not featured in a particular scene are situated. The omnipresent piano shifts positions depending on the scene. Janine Vreatt’s lighting design is outstanding and works cohesively with the set and the music. And Matthew Smith’s costumes accurately portray the attire from the period. At a time when a large segment of our country is railing against the disproportional power the top one percent of income earners accrue at the expense of the working class and when a significant part of the country currently sees our president to be dictatorial and unfit for office, the historic The Cradle Will Rock provides frightening similarities. 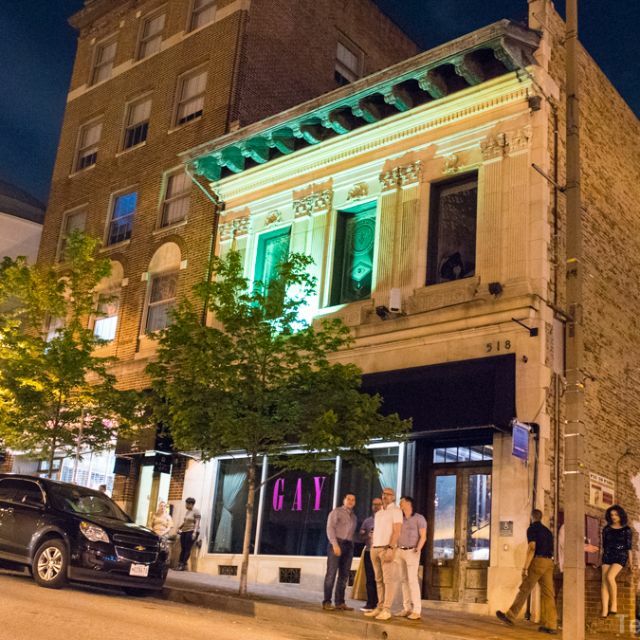 A talented and enthusiastic ensemble under the solid direction of Sean Elias gives Iron Crow Theatre a welcome boost as it launches its new season. Running time: One hour and thirty minutes with no intermission. Advisory: The Cradle Will Rock contains mature themes, adult language, sexual content and violence and is not suitable for patrons under age 18. The Cradle Will Rock” runs through October 8 at The Baltimore Theatre Project, Baltimore Theatre Project, 45 W. Preston St., Baltimore, MD 21201. For tickets, visit online .